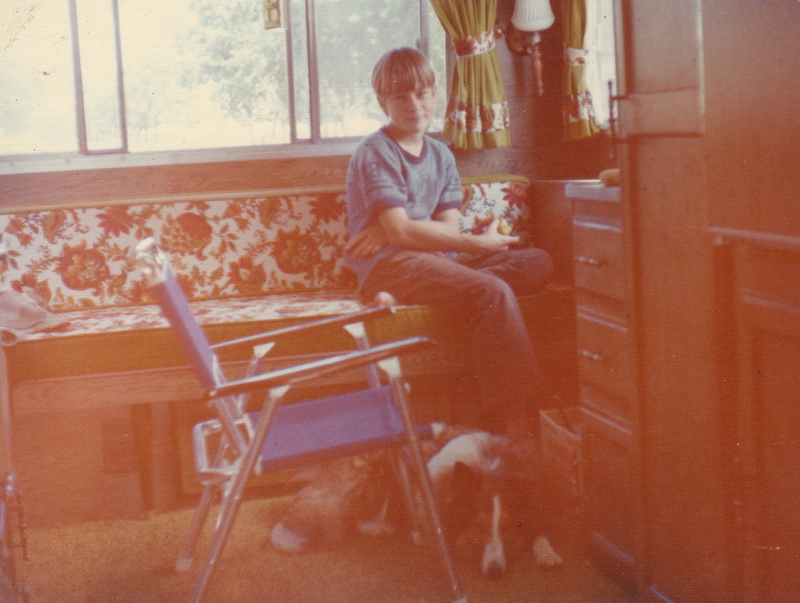 Last week I wrote that Mom’s first major depressive episode struck just after her mother died in 1981. What I didn’t know then was that grandma had been unhappily married to grandpa for nearly 50 years. He’d cheated on her with another woman just after Mom was born in 1935. When I asked Mom why they didn’t divorce, she said something to the effect that in a small Indiana town like Greensburg, people didn’t “just divorce.” It wasn’t accepted. And, being the scrappy Irish woman she was, Grandma Mamie was going to stick it to Grandpa Raymond good: they sniped at each other constantly. I never recall a moment of affection or companionship between them. How Mom first learned of her father’s infidelity isn’t clear, but they always had a strained relationship. That her freewheeling, philandering father outlived her ever-suffering mother must’ve gotten under Mom’s skin. I can only guess. For Mom, the ’80s were difficult. All her boys had left home: after high school Brian went to Ely, Minnesota, in 1981; I had just enrolled at a community college in White Bear Lake. It’s timely to remember my mother’s struggle with depression now, since I just emerged from my first major episode in two years. Before that I’d been seven years episode-free. See, that’s the tricky thing about a disease like depression—you act like you’re just like everyone else (everyone else seems to think so, too) and then BAM—you’re goddamn useless. After emerging from the last episode with upgraded dosage on my medication, support from my doctor and friends, and a new short-term therapist, I’m still grateful that I am, truly, my mother’s son. Being a depressive is complicated. We seem reserved, aloof, perhaps even disdainful, but it’s all part of a vast interior drama playing out in our heads. I wonder how Mom navigated the symptoms: at first withdrawal, loss of appetite, change in habits, and lack of interest in favorite activities. Then there’s the tears, buckets of tears. And the lethargy. What—exactly—was stinking? Him or me? During Mom’s ’80s episode, we worked gingerly around her. When, at Christmastime 1983 I brought my girlfriend, Therese, home to meet the folks, Mom was unresponsive. Therese brought wine and cheese, which Dad happily accepted, but Mom was checked out—catatonic, even. I was embarrassed to tell Therese about Mom’s illness, an embarrassment I regret given what I know now. After I was diagnosed in 1987 (the official verdict was dysthymia with occasional double-depressive episodes) things slowly came into focus. 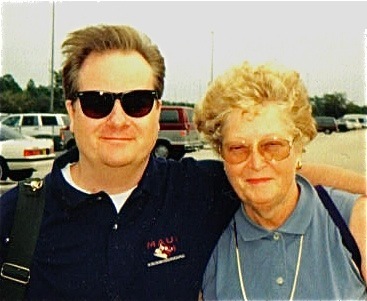 I’ll cover the details in future posts, but suffice to say Mom and I crossed paths with our illness in the mid-1980s. Growing up, I never remember Mom “sad” or “down.” She kept busy, chattered to herself while she ironed clothes, watched daytime soaps, not a clue that the death of her mother would bring the disease to the surface. Of course I wouldn’t know if she suffered post-partum depression after my birth, or for that matter, Brian’s. That’s all history now. 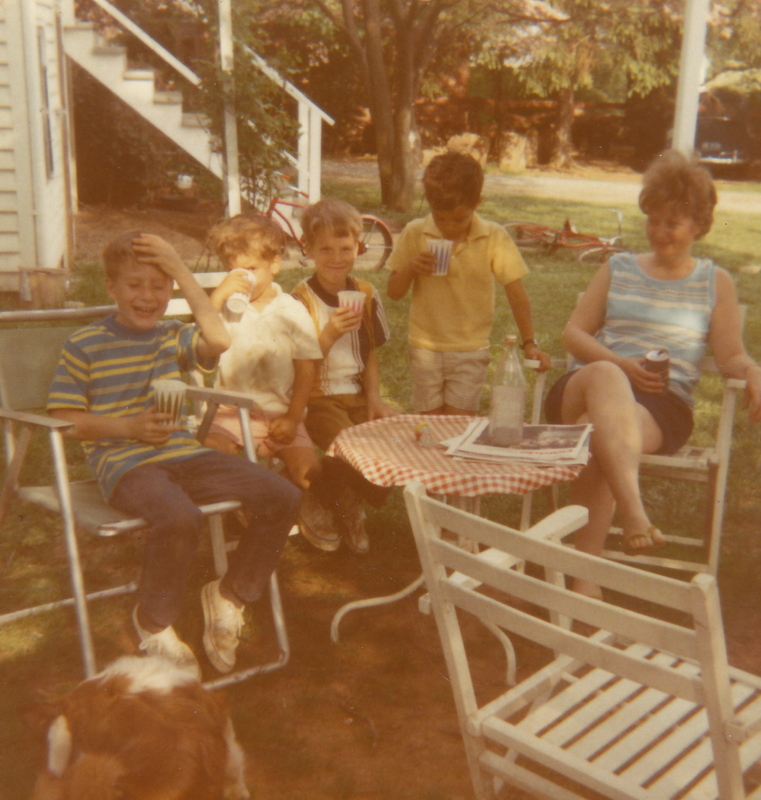 Mom could be sweet, and she liked my jokes—I always seemed to surprise her (the picture at right is from Maryland, 1968, left to right: me, Bart Fox, Brian, Donnie Fox and Mom in the backyard laughing about something that must’ve struck me as hilarious). Being smack in the middle of the 1960s-70s feminist revolution, Mom was probably picking up vibes that things were changing. But she didn’t know what to do about it, given her role as wife and mother. Later, later. It’s always later for depressives—a term, by the way, I loathe. I hate it because we want to be “normal” people, lead “normal” lives and not feel like our mental illness defines us. But it molded my mother’s life—and death—and continues to shape mine. These days I have a more fine-tuned radar on my moods—better than I ever have. But it will return, like it did to Mom when, after retirement in Florida and a couple years in the sun, it caught up with her and, eventually, took her life. I want to be the best I can while I have the strength to. I’ll always be my mother’s son, but I don’t necessarily have to have my life end as hers did. ~ by completelyinthedark on October 16, 2011. Beautiful post big bro…thank you for sharing. A sad but good story, it has some parallels to my mother-in-law’s parents. My mother-in-law group up in Peru, IN. Ooops! That’s grew not group. thanks for the comment. Seems that post-Edwardian “stiff-upper-lip” generation also got the lion’s share of heart disease.